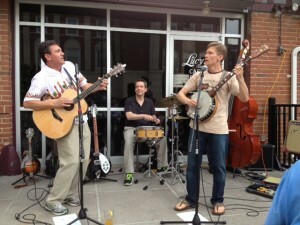 The featured image is of BSE shareholder Brian McCartney and the band the Boone Howlers. Brian plays the drums for this bluegrass-influenced ensenble that has played various venues in Columbia, Missouri. Most recently, they were found at Coley’s American Bistro on Sixth Street for a late-afternoon patio performance on Sunday, June 30, 2013. When he not playing the drums, Brian has a general administrative practice with an emphasis in the area of telecommunications law. He is the author of the chapter on damages to personal property in the Missouri Bar’s Damages desk book and has also co-authored the chapter on administrative rules and rulemaking in the Missouri Bar’s Administrative Lawdesk book.